Antipodes products are created and made in New Zealand. All of their products are vegetarian friendly, approved by the vegetarian society, completely cruelty free and never tested on animals and certified organic. Their products are made with the environment in mind; using the best ingredients possible and ensuring none of their products, nor the before or after process of creating their products, affects the environment. They are ecologically and environmentally aware and have a lot of respect for nature and the World around us. Brands which ethics like this really grab my attention, and my purse strings. I wish so many more brands would take a leaf out of Antipodes book. Their ethics make me love the brand even more than their amazing products which do wonders for my skin and senses. So what is so great about this unique hand and body cream? The Joyful hand and body cream has nutrient-rich avocado oil which delivers and immediate boost to abundant skin nutrients such as dry, tired and stressed skin. A captivating, velvety cream, this leaves your skin dewy and fragrant and free from oily residue. 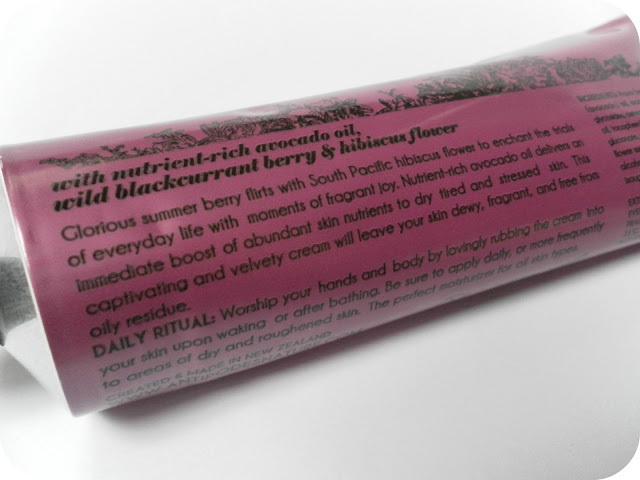 It's premium bioactive ingredients are avocado oil, wild blackcurrant berry and hibiscus flower. This smells utterly amazing. And when I say utterly amazing, I mean the scent of this leaves my mouth watering. If this was edible, I'd probably eat it. I can't get over how beautiful and yummy this smells! I've been reaching for this a lot over my other hand creams because of the scent!! Performance wise it leaves my hands feeling silky soft, and as it says, there is no greasy feeling afterwards which I find with some hand creams. This hand cream stays on my desk, and I use it throughout the day. It actually comes in a huge 120ml tube, and you can as the name suggests use it for your hand and body, but I just use this for my hands. I love it! And I really like the packaging, too. It's brighter and more girly than the usual Antipodes packaging! Another winning product from Antipodes for me! You can find it on the Antipodes website and a 120ml tube costs £22 and is sure to last you months! This sounds like a great hand cream! I have an obsession with trying out different ones, I love Soap & Glory hand food but it sunk into my skin waaaay to fast!